Ted and I have completed the second leg of our journey. (The first leg was a drive from Boulder to the Denver International Airport, courtesy of our dedicated colleague and friend, Jenn Bohlander—thanks Jenn!) Speaking of legs of our journey, we still have a few more to go: Dallas to Santiago, Chile, then Santiago to Punta Arenas, Chile. From Punta Arenas we cross the Drake Passage to Rothera Station on Adelaide Island, and then we have one more flight to the Beta site where we’ll establish our base camp. From here, the planes get smaller and smaller (Boeing 777 to Santiago, Embraer to Punta Arenas, DeHaviland Dash-7 to Rothera, and finally a ski–equipped Twin Otter to our camp site to conduct the study). We flew to Dallas on American Airlines, and we’re now waiting to board our plane to Santiago, Chile. Ted and I changed a few dollars into Chilean pesos: $54.00 is about 24,000 Chilean pesos, so we have an impressive stack of 1000-peso bills. As we travel, we’re still working on final preparations. We’re laying out our initial plans and going through our lists of equipment one more time. We also managed to look at a few images of our field site while on the plane. We’ve just had a chat with Erin Pettit, another member of our field team, and she is ready to depart Alaska for Punta Arenas. We hope to see her by Thursday. We’ll check in from Punta Arenas with an update and a few photos. Rob Bauer (left) and Terry Haran (right) show off the main control system and tower. We are currently testing a prototype of the weather and GPS system (AMIGOS), designed by Ronald Ross of Australia, that we will deploy on six glacier sites in Antarctica this winter. 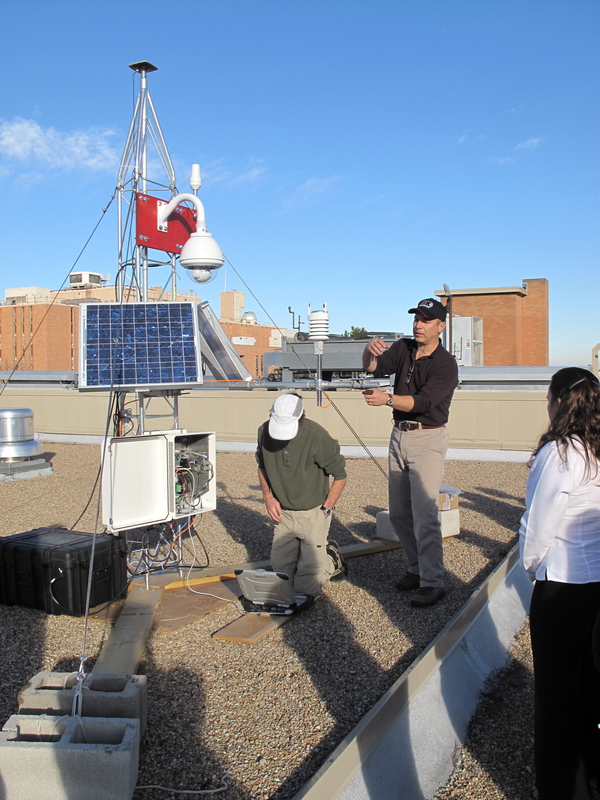 The first AMIGOS system is now up and running on the roof of the NSIDC building. We are using the system to test software and sensors before we re-pack the main controlling computer, instrument hub, and satellite data phone uplink. Two 40-watt solar panels and three large batteries power the system and data uplink. 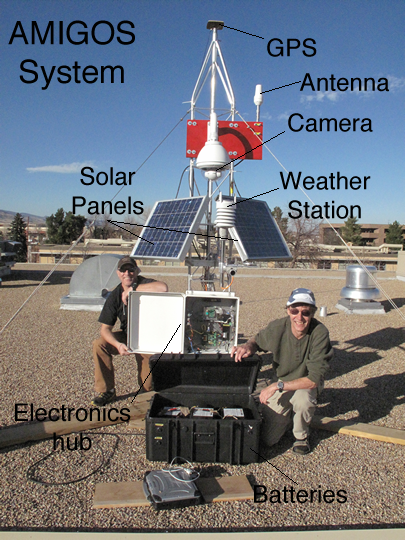 An instrument boom contains an all-in-one weather station, a sun and snow brightness sensor, and (for one station) a snow-depth sounder that measures snowfall. Higher up on the tower is the camera system and the satellite data uplink antenna, which will transmit data back to us. A precision GPS system sits at the very top of the station, capable of determining the movement of the ice to within centimeters, up to six times per day. To learn more about the trip, see About the Expedition. Ted Scambos explains the AMIGOS sensors and data system to NSIDC staff.